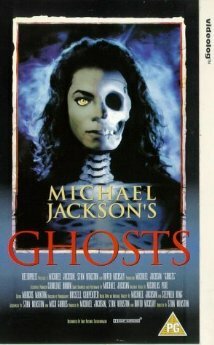 Buy or Rent Michael Jackson's Ghosts (1997) Movie DVD & BluRay Online! Movie Plot: The story tells of a small town that is very much bothered by a very strange and weird man living in a visually haunted house. One day the mayor decides to go with a couple of people from his town to the weird man who’s living up the hill, and tell him to leave. When they reach the mayor starts convincing him to leave his town, but the people with the mayor started liking Michael Jackson, and he started singing to them and scaring the mayor. Until in the end the mayor gets too scared and runs away, and the people come to know that Michael isn’t too bad after all.